If you thought that the chilli is a star of Indian cuisine, then it is much-much more so in Mexican food. It is almost a staple of that cuisine. “In Indian food, you have one or two types of chillies that you use all the time,” says Chef Tania Tovar, wrinkling up her nose, with kindly disdain. “In Mexico, we have over a hundred types of just dried chillies. Each dish uses its own kind to give the correct taste. 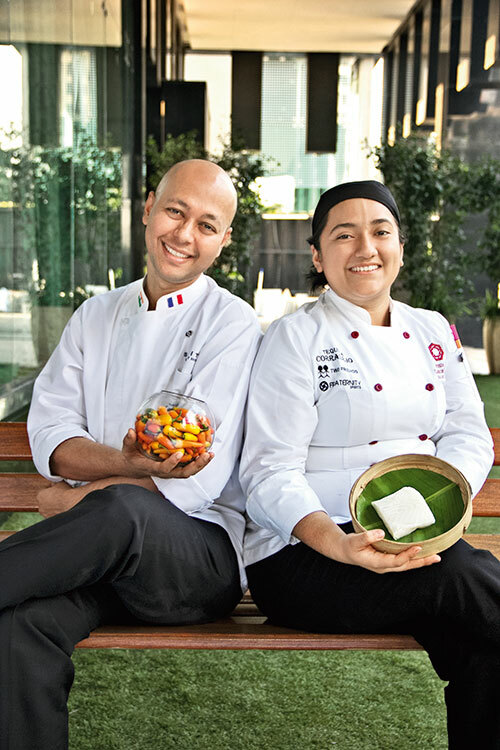 It is the variety of chilli used that gives the flavour.” This young chef is in India from Mexico City for just the week and is standing primly next to her selection of Mexican dishes at the Sofitel Mumbai BKC’s Pondichery Café. The selection has been marked in labels of a different colour from the rest of the vast repast. I pick at these and find them delicious. Chef Tovar says that she has experimented with Indian dried chillies and discovered that these are similar in taste to some in Mexico. Chillies are at the centre of our cook-off between Chef Tovar and Chef Indrajit Saha, executive chef, Sofitel Mumbai BKC. The variety of Mexican chillies in general includes the fiery hot habanero, the green almost-staple jalapeno, the guajillo that is used in making a sweet and hot salsa, the popular Serrano which is great for roasting, the chiles de arbol that is used fresh, dried or powdered. And that is just tipping the top of the chilli tree. Mexico, it seems, uses the widest variety of chilli peppers in the world. The chilli is very much connected to the lives of the people, their celebrations, rituals and family meals. It is a particular kind of chilli that presides, for instance, in the making of the well-known Mexican celebration dish, the mole. Some visiting Mexican friends once told me that if you have not been invited to a party, you save face by claiming that you were home making mole, a truly complex dish which takes hours to prepare. Chef Tovar, this afternoon, is cooking up a dish called pescado al pastor, which includes our other star ingredient of the kitchen today, sea bass (pescado means fish). The fish is smothered in a piquant red sauce made of a chilli paste that is a combination of chillies and vinegar called achiote which makes your mouth water even as you take in the fiery aroma. Mexican food is more than tacos, tortillas and tamales, this dish seems to prove. Some of the other offerings that she has introduced to the buffet table has been chorizo tacos with avocado sauce, tlalpeño broth, Tex Mex salad, pibil shrimp tostadas, vegan stuffed chili with nut sauce, aguachile, fish chimichangas, chicken tinga burritos, mushrooms with garlic and guajillo chili and more. If you thought that Chef Saha was going to take the easy way out in the kitchen, think again. He is not about to cook up an Indian dish with chilli thrown in, quite casually. 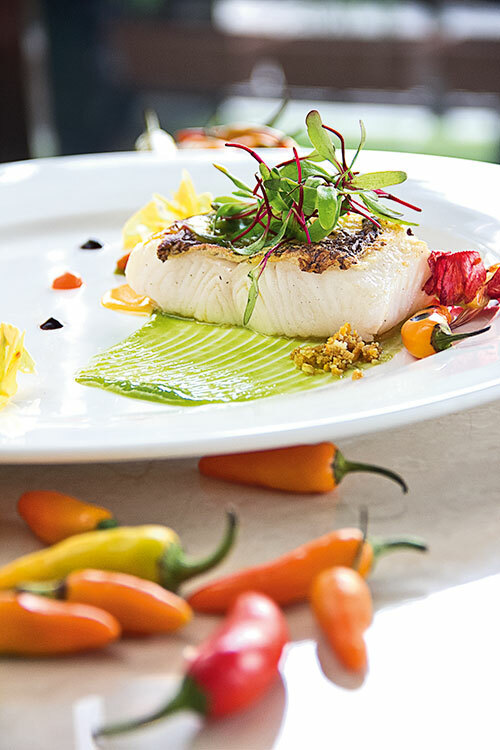 Where Chef Tovar’s dish is a traditional one, Chef Saha is in his normal experimental mode. This culinary enthusiast is not about hot and fiery, but prefers rather to impart just a hint of heat to his dish, today. His star ingredient, vadouvan spice, is a ‘Scandinavian spice mix similar to curry powder’, imparting a subtle taste. The dish further demonstrates his philosophy of ‘openness towards cuisines’. This culinary experimenter believes in taking the finest from the cuisines of the world to create his own blends in the gastronomic world. “The basic methods should always be perfect,” he says. “And then one must aim towards a balance of flavours – sweet-salt-spice should be finely poised to arouse all the taste buds and make you want to eat more.” The undertones of his dish blend the taste of the sea bass with the sweetness of the crumble and just that hint of spice. 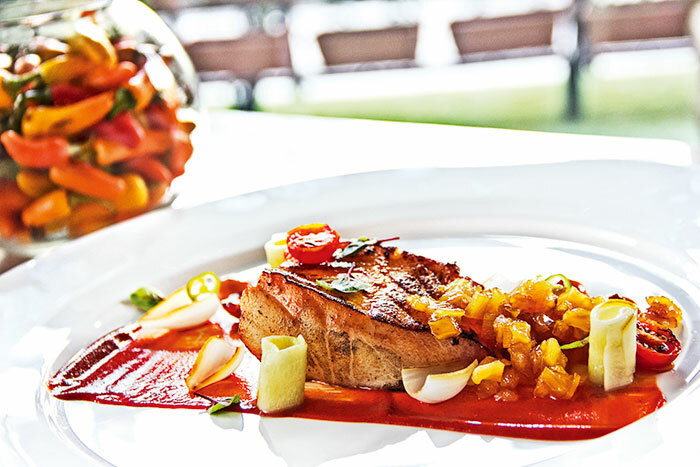 Chef Saha prefers a simple but modernistic approach to food, adding that ‘small is often more’. He has travelled and worked around the world and picked up the best along the way, coming up with his own culinary style. While our Mexican chef has been trained in traditional cooking, she is not averse to a bit of experimentation herself. “I like so much Japanese food,” she says in her inflected English. “I have so many books of sushi.” She makes, for her family, a sushi of Mexican meats, she says with a laugh. At home, she cooks a lot of spicy pasta as well. “Now my family wants me to cook Indian food but learning even the names of the dishes has been difficult for me,” admits this creator of Mexican cuisine. Chilean sea bass, 160 gm; Salt, 2 gm; Pepper, 2 gm; Olive Oil, 20 ml. Fish stock, 500 ml; Parsley, 500 gm; Pear, 500 gm; Apple juice: 60 ml; Salt, 2 gm; Xanthum gum, 3 gm; Parsley oil, 10 ml; Chilli powder, 2 gm. Carrot, 300 gm; Cream, 200 ml; Fish stock, 50 ml; Salt, 2 gm; White pepper, 2 gm. Almonds, 125 gm; Sugar, 250 gm; Butter, 60 gm; Glucose syrup, 30 gm; Peanuts, 100 gm; Cornflakes, 100 gm; Curry powder, 10 gm; Thyme, 2 gm; Maldon salt, 5 gm. Beetroot, 250 ml; Sugar, 5 gm; Salt, 3 gm; Agar-agar, 2 gm. Fish Stock, 200 ml; Orange juice, 200 ml; White wine, 50 ml; Butter, 150 gm; Onion, 25 gm; Garlic, 5 gm. For the garnish: Beetroot micro greens; Edible flowers. Reduce the fish stock. Add the pears without skins and add parsley leaves. Discard the stalks. Add apple juice, salt and chilli powder. Finally, add the Xanthum and blend it. Peel the carrot. Cook it in the fish stock and cream. Season with salt and pepper. The final consistency should be thick. Roast the almond and peanut and crush coarsely. Cook the glucose with butter and sugar until caramel forms. Add corn flakes, curry powder, salt and thyme. Add the roasted almond and peanuts to the glucose mixture. Break the caramelised items, crush to small pieces and dry on top of an oven. Reduce the beetroot juice and add sugar and salt. Add agar-agar and leave in the fridge for two hours. Once it sets, blend it again. It is ready to use. Reduce the fish stock and orange juice to quarter of the original quantity, with onion and garlic. Strain all the ingredients. Finally, add the hard butter with a whisk. Plate up the dish as shown in the photograph, decorating with the garnish. Fish, 2 kg; Chopped onion, 1/2 no; Coriander, 200 gm; Green chilli, 2 nos. Guajillo chilli (dry and long), 2 nos; Garlic clove, 1 no; Vegetable oil, 100 ml; Achiote (chilli paste made with dry chilli and vinegar), 200 gm; Orange juice, 200 gm. Butter 100 gm; Pineapple, 1 chopped; Water, 2 cups; Sugar, 1/2 cup. Marinate the fish with the given ingredients. Fry the dry chilli along with the garlic and blend this with the chilli paste and orange juice. Keep aside for three to four hours. Scar the fish on both sides. Make a salsa with the onion, chilli and coriander. Make the compote with pineapple, water and sugar. Cook till tender and blend. Serve the fish with the salsa and compote.